The beauty dish reflector is a legendary light shaping tool popularized by fashion and portrait photographers. 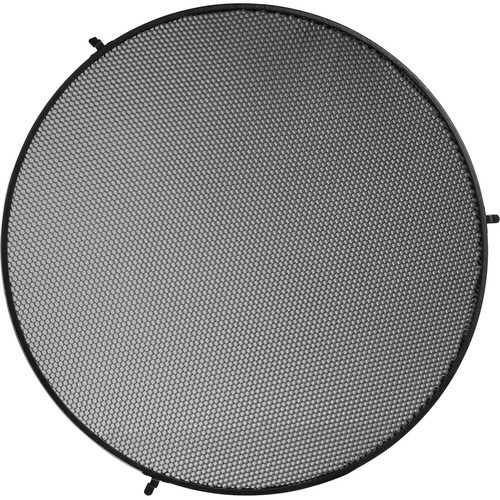 This Impact 40° Honeycomb Grid for 22" Beauty Dish Reflector alters the shape and light output of the reflector by tunneling the light forward into a narrower 40° beam. The grid offers slightly increased contrast, directionality and spill light control. It's an ideal tool for achieving Rembrandt-like lighting effects. 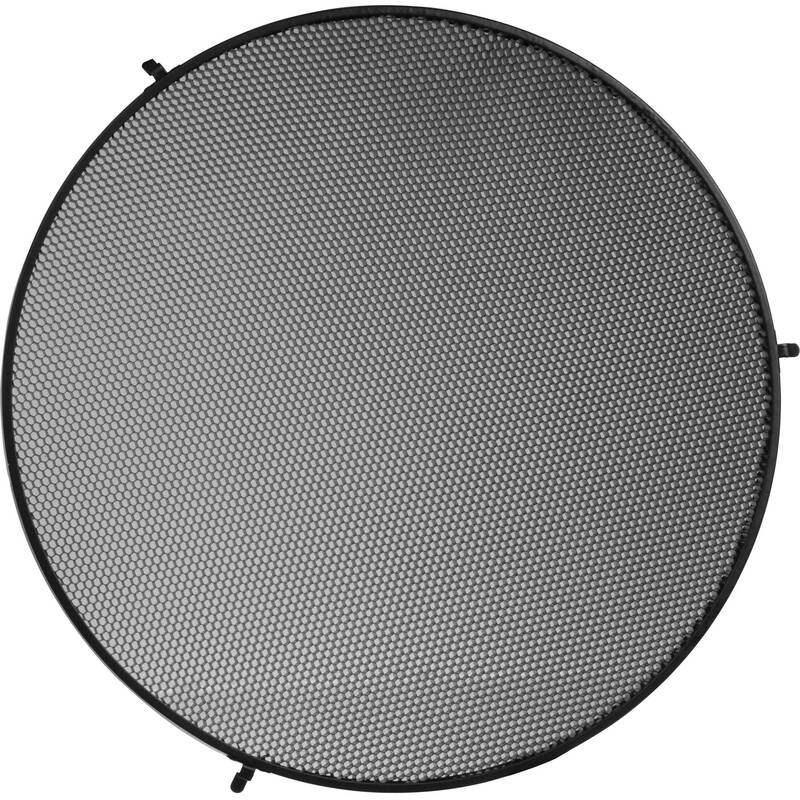 Box Dimensions (LxWxH) 21.8 x 21.6 x 1.3"
40° Honeycomb Grid for 22" Beauty Dish Reflector is rated 4.1 out of 5 by 7. Rated 5 out of 5 by MWAC from AWESOME FOR ATHLETIC FITNESS PHOTOS Directs the light in a straight line to your model. Make sure to position your beauty dish appropriately , close to the model, about 2 feet above and that the holes of the grid are directing the light the way you want it. Use the modeling light to guide you. Rated 5 out of 5 by Robert from Controls light spill well I had to do a shoot for a dancer's pre-audition bio and wanted to control light spill as much as possible. The grid did the trick! It snaps in and stays in. Both the dish and the grid aren't heavy which is nice. Light quality is excellent. Rated 4 out of 5 by Tim K from Nice way to control your light The product is straight forward. It snaps on tight, securely and quickly. I give one less star because i am afraid that the clips that hold on to the beauty dish won't last forever. Seems a tad week after a few uses. Rated 4 out of 5 by Glenn E. from Nice Grid Good build quality. Mounts well to the Impact Beauty Disk. Unfortunate that it's only offered as a 40 degree grid. What's up with that? Rated 5 out of 5 by Blueheronsharon from Works great & fits Flashpoint 22 beauty Works great and adds a lot of drama to the photos. It also fit my flashpoint 22 inch beauty dish perfect. Will this also fit a Mola Demi 22 beauty dish? does this fit the mola demi? will the Impact Grid work with Hensel 22 beauty dish reflector ? Yes, the impact grid will fit on the Hensel dish. fit with paul buf 22 beauty dish? I actually purchased this with a 22 beauty dish and it didn't fit properly. One of the latches wouldn't snap or even go in the way the other two did. Does this grid fit Bowens? Does this grid fit Elinchrom snoot EL26061?